Marieu and Lucretio a.k.a. The Analogue Cops are the founder members of the Restoration assault unit, one of the last independent underground labels on the planet. Actually LUCRETIO and MARIEU are pledged in a more dub and deep house oriented project, but always deeply influenced by their passion for american music. Their productions are appreciated and played by djs such as James Pennington, Alan Oldham, dj Buzz Goree, Ame, Santiago Salazar, Steffi, Tama Sumo, Prosumer, Radioslave, Dor, Eddie Flashin´ Fowkles, Rick Wade, Pacou, Mad Max, Patrice Scott and Marcel Dettmann. They have 12 releases out on 12" on their own label RESTORATION distributed exclusively by Diamond and Pearls Berlin. Lucretio´s track on RST006 appears now on TAMA SUMO´s Mix CD for Panorama Bar. 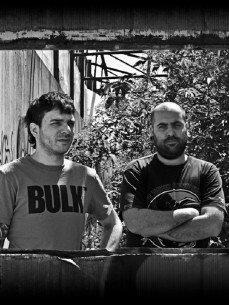 In the spring of 2009 they started a collaboration with Steffi (OSTGUT TON / KLAKSON): the name of the project is THIRD SIDE and their full length "Nyx" E.P. (rst010) was higly acclaimed and quickly sold out. They collaborate with MIXWORKS Detroit and Lucretio produced the first two eps on the label, including the hit track BERLIN DUB featured on Fabric Mix CD mixed by Ame. Since september 2009 they release on the label LIVE JAM RECORDS, as ACE (together with EMG) and as APPOINTMENT (with EMG and JOHN SWING); in the summer of 2010 they founded the label APPOINTMENT together with their friends of LIVE JAM RECORDS. As APPOINTMENT they made 2 official remixes of MOODYMANN´s track "I can´t kick this feeling when it hits" that will appear on DECKS REWORKS.